The Film Comment app is free to download, and features all the articles from the print edition of the magazine, plus weekly digests of our web content, including our podcast. A yearly subscription is $9.99. When you become a subscriber, you can download any issue published while your subscription is active. If your subscription lapses, you will still be able to read the issues published while you were an active subscriber. You can individually purchase issues published before you began your subscription for $1.99. Tap the “Restore” button to make previously purchased issues available on your iPhone, iPod or iPad. You can update or cancel your subscription in your iTunes Store account settings. 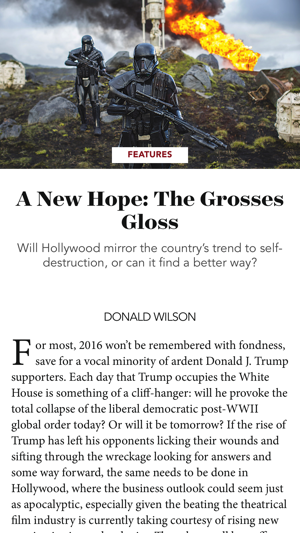 Film Comment continues to be the most urgent, cutting-edge magazine of film criticism in the U.S. 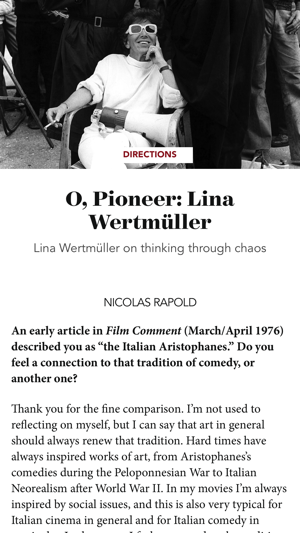 Still the greatest place for the smartest writing on cinema after more than fifty years, Film Comment keeps the conversation going in its sleek new digital format, which gives the reader more ways to experience reviews, interviews, features, and news about the most important latest movies. Founded under the editorship of Gordon Hitchens in 1962, Film Comment is a bimonthly print publication and website of the Film Society of Lincoln Center. Its subsequent editors were Richard Corliss, Harlan Jacobson, Richard Jameson, Gavin Smith, and, currently, Nicolas Rapold. Past and present contributing critics include David Bordwell, Manohla Dargis, Raymond Durgnat, Roger Ebert, Manny Farber, Howard Hampton, Molly Haskell, J. Hoberman, Eric Hynes, Kent Jones, Dave Kehr, Farran Smith Nehme, Nick Pinkerton, Geoffrey O’Brien, Frank Rich, Jonathan Rosenbaum, Andrew Sarris, Richard Schickel, Amy Taubin, David Thomson, Amos Vogel, Robin Wood, and many more. - Updated app access information for current subscribers. 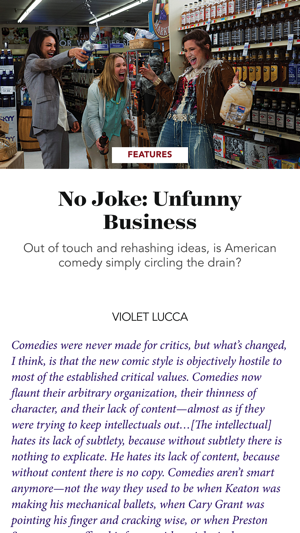 Scrolling in a magazine reader app is horrible. Put in page breaks. SO happy Film Comment is digital so now my commutes can be something I look forward to, and so I can immediately bring up a review after I see a film. 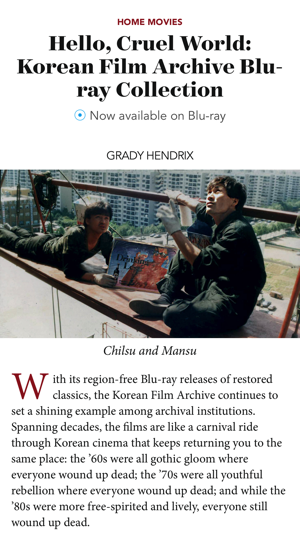 This is without a doubt the best place for film writing and criticism in American periodicals, and you wouldn't be a true cinephile without it on your devices as well. Just WOW. This app is so amazing. It is so fast and fluid. I can easily read my favorite film magazine anytime, anywhere. GREAT JOB guys! !